I've visited this Tim Hortons (269 Laurier Avenue West, Ottawa) a couple of times since moving to Ottawa. Located downtown near the intersection of Bank Street and Laurier Avenue, this Tim Hortons location is convenient to stop off at to meet someone after work during the week. During the week? Yes, this location is oddly closed on weekends as it mostly caters to the local government office worker clientele who vacate the downtown on weekends. Recently I visited on Friday afternoon to find about three tables occupied by government employees chatting over coffee. I joined the sparse customer line with only one person in front of me waiting. I've waited in this line on previous occasions to find myself fifth in line and not going fast. Thus, it really depends on when this location is busy or if you speed through the line or end up languishing waiting for service. The main issue with this Tim Hortons location is the lack of bakery orders which means there is not a dedicated person to make the bakery items like sandwiches, chili and bagels for those at the front. This means individual front counter employees end up making the bakery items or a manager has to be found to make the items. Otherwise it could be a lack of staffing for the busier times at this location. Perhaps better study and management of personnel to increase during busier times might be in order to tweak this issue. This time I was lucky and was served right away. Once being attended to by the Tim Hortons employees at this location everything usually goes well. They are attentive and fast to retrieve what you need if it is available. Yes, later in the days the front display case of donuts and other sweet treats can be sparse. But with a closing time of 5:30 P.M. weekdays and closed on the weekends this is expected. I ordered, handed my change over and looked for a seat along the long counter overlooking the window to watch the passing pedestrians. 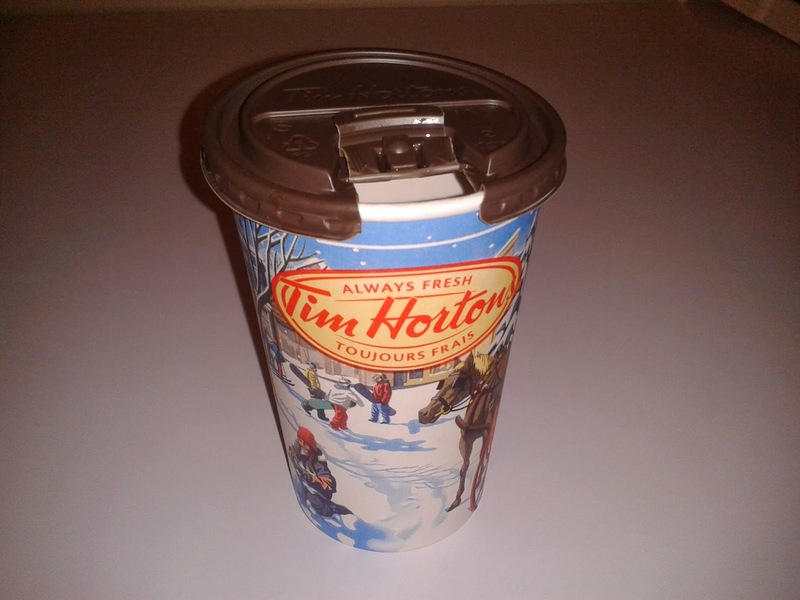 I was surprised to see my coffee to poured into and handed to me in a Tim Hortons printed Holiday cup. Most other locations in the Ottawa area had run out and moved onto the regular boring run of the mill paper cups or onto the new Tim Hortons 50th anniversary cups. I sat down, looked out the window and sipped my coffee quietly. Just the great taste of a regular Tim Hortons coffee made to spec. No screw ups by adding sugar or making it too strong, just coffee made to Tim Hortons expectations. Overall, this Tim Hortons location needs a little tweaking. Sometimes during busier times, service is slow and inconsistent. During slower times service is decently apportioned. Perhaps Tim Hortons management could gauge high and low customer demand times and reapportion staffing hours accordingly. Otherwise this Tim Hortons works to serve the local government employee clientele. Weekends though? Try elsewhere as this one is closed.